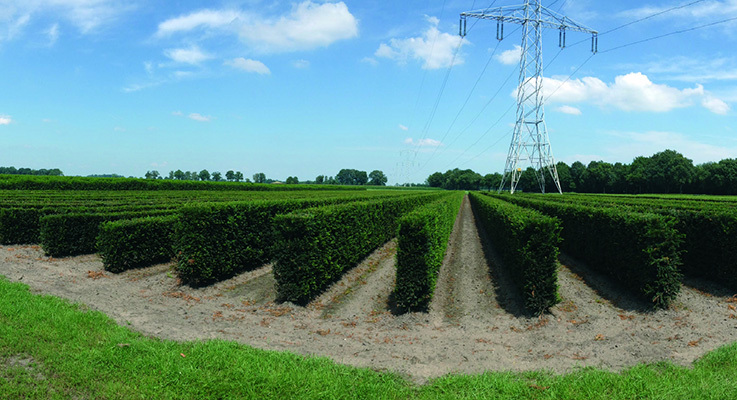 According to Markus, the product gives landscaping professionals a quick solution for planting five-years-mature privacy hedges in a short period. Because of the mobile nature of the package design, 20 hedge units can be planted in an hour if using an excavator, and nearly 500 feet of trees can be planted in an average workday. On the farm, some 53 lineal miles of hedges are nursed, irrigated, trimmed and undercut using precision-agriculture production technology. Tractor-mounted GPS technology allows workers to prune hedge crops within ½-inch accuracy, tending to two rows at a time. Each hedge is pruned 3-4 times a year to create a thick wall of foliage. At the time of harvest, the trees are harvested using a u-form blade to ensure 90 percent of all the root system remains intact. 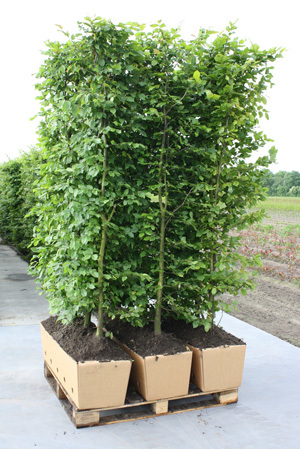 Hedges are placed in one of InstantHedge’s unit containers: a system of four trees in a 40 inch long and 16-inch deep biodegradable cardboard box. End users can plant the entire unit — box and all — in the designated location. Tree roots will grow through the cardboard about a month after planting. 13 tree varieties are available in heights ranging between 3 to 6 feet tall. Ordering information is available online. InstantHedge may also be contacted by phone at 503.587.0102 or by emailing order@instanthedge.com.